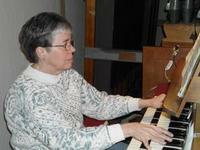 We are privileged and honored to have Janet Scott as the organist and music director at St. Mary’s. Janet skillfully plays our pipe organ, piano, and occasionally the harpsichord at our services to accompany the choir and the congregation. She also plays solo pieces which precede and conclude our services, setting the mood and tone for a thoughtful, respectful, and meaningful church experience. During the week, Janet works as a sound recording cataloger for the Cook Music Library at Indiana University and lives in Bloomington with her husband, who is also a musician and a harpsichord craftsman. Janet also accompanies graduate-level Early Music students and performs in Early Music Institute concerts. In addition to her outstanding skills as a professional church musician and music librarian, Janet is also an accomplished harpsichordist. She has performed in Canada, the United States, England, and Austria. Janet is a recipient of numerous Canadian government arts grants, was a founding member of two baroque ensembles, served as the manager of a baroque orchestra, was the artistic director of a summer music series and toured the province of Nova Scotia while performing at historic churches in a prominent Canadian concert series. Janet also freelances with ensembles in Ontario and the United States. The parishioners at St. Mary’s appreciate Janet Scott not only for her remarkable talent and dedication as our Music Minister, but as a caring and loving member of our church family. She works with the adult and youth choirs throughout the year to provide special music that connects lyrics with lessons, and chooses hymns and anthems which complement the sermons and enhance parishioners' spiritual growth. All who visit St. Mary’s will find themselves inspired and delighted when they hear her command of our 236-pipe organ as she plays traditional, classical, and spiritual music each Sunday morning.